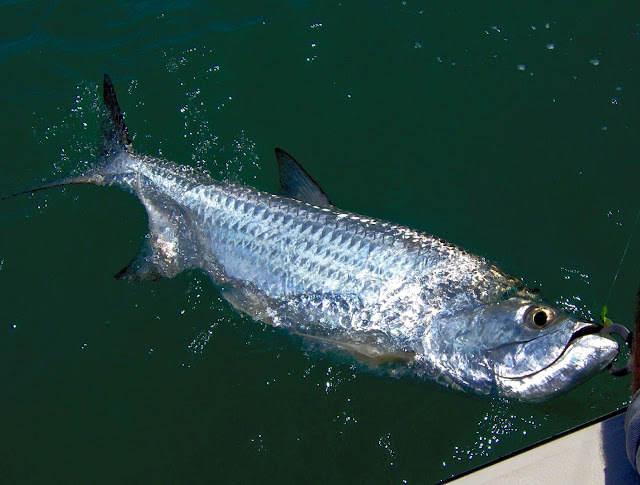 This isn't a very big tarpon, probably no more than 50 pounds, but it was over 40 inches long and that means it has to stay in the water. This has been the law in Florida since 2013 and it's something I've been in favor of for a long time. There is no reason to pull these fish out of the water after fighting them to exhaustion and it's one of the reasons I rarely post tarpon pictures on this blog. (That, and I haven't been landing many so far this year.) But anyway, congrats to Jim from Michigan on landing this fish and just a reminder to use heavy leaders, go full throttle on your drag, and keep these bigger fish in the water if you want to photograph them.